It is very true that balconies, staircases, terrace, and landings become quite unsafe if they are not equipped with balustrades. From being a safety requirement for residential and commercial buildings, the demand of balustrades has definitely gone beyond. Gone are the days when balustrades used to mar down the aesthetic appeal of buildings. The present-day balustrades are highly appealing, and they do not make a hole in your wallet. Among the different balustrade material options available in the market, glass is certainly one of the most popular ones. The modern and stylish appeal rendered by glass balustrading is something that is quite hard to resist. There are number of reasons that add to the popularity of glass balustrades. So, before you start looking for the right balustrade supplier, let us throw some light on the advantages of going with glass balustrade. Why go for glass balustrades? Aesthetic appeal - Glass balustrades can easily gel with the décor of your home. One of the major attributes of glass balustrades is that they can completely complement modern buildings of any style. Being unobtrusive in nature, the glass balustrades do not cause distraction in the décor of your home. On the other hand, the balustrades made from other materials usually feature horizontal or vertical bars, which can look quite unappealing. Cleaning - It is quite easy to clean a thick panel of glass rather than cleaning a complex design made from stainless steel, wrought iron, timber or wood. All you have to do is simply wipe down the glass panels with a soft piece of cloth or wet sponge. Glass balustrades are really low on maintenance. Good amount of sunlight - Other materials like wood, stainless steel, timber, etc. do not allow the passage of sunlight through them. 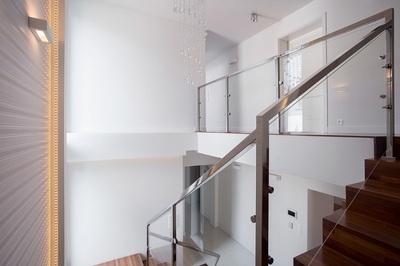 On the other hand, balustrades made from glass do not cause obstruction, which in turn keep the space brighter. This is the reason why more and more people nowadays are opting for glass material for balustrading staircases and balcony. Moreover, a brighter space certainly gives more positive vibes than a gloomy looking space. Easy visibility - When the balustrades are transparent, it becomes possible for you to see what is happening on the other side. So, if you have kids at home, you would not want like having obstruction when it comes to keeping an eye on your kids. 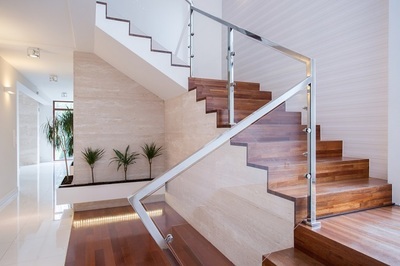 So, for a clearer and neat appearance, you should definitely opt for glass balustrades. Longevity - Yes, the durability of glass balustrades is quite impressive. Some people think that glass as a material is quite fragile in nature. But, if you take into consideration the toughness of the toughened glasses available these days, you will be left amazed with their durability. In addition, glass balustrades are not susceptible to termites and rust. Hence, you can surely remain assured about the longevity of glass balustrades. Design options - In the market, there is a wide range of glass balustrades to purchase from. You can pick a design that best suits the décor of your building. For example, frameless glass balustrades are quite apt for a modern and sophisticated look. Infill and mini post are also two good options available these days. So, those were some of the advantages you can get with glass balustrading. In order to get the best results, do not forget to purchase these items only from the best suppliers or manufacturers in the business. When you choose a supplier, make sure the supplier offers complete installation service of the same. Plus, the supplier should also take the responsibility of getting the glass panels transported to your location.